City Hall is losing at least Sh300,000 daily in parking fees since the implementation of the new Sh200 daily parking fees by the county. 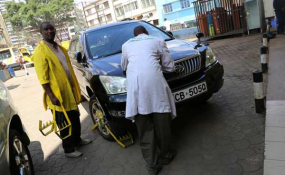 Nairobi County Director of Parking Services Tom Tinega said revenue from daily parking has dropped from the daily average of Sh1.5 million before the introduction of the new charges to an average of Sh1.2 million currently. Mr Tinega, however, said the volume of private motorists parking in the capital city has increased from a previous daily average of 4,500 to the current average of 5,200. The county government reduced the parking fee on January 14, down from the Sh300 that Nairobi motorists were paying before. A week preceding the coming into effect of the new rates, the county raked in Sh1.54 million on January 7 from 4,674 vehicles that were parked that day. This then dropped to Sh1.52 million the following day from 4,608 vehicles. January 9 recorded Sh1.51 million from 4,509 vehicles, January 10 had Sh1.5 million from 4,485 while January 11 recorded Sh1.45 million from 4,375 vehicles. After the implementation of the new daily charges, the county recorded a revenue of Sh1.3 million on January 14 from 5,034 vehicles, Sh1.29 million from 5,513 vehicles the following day and Sh1.21 million on January 16 from 5,111 vehicles. On January 17, the county collected Sh1.26 million from 5,323 vehicles while on January 18, the revenue dropped to Sh1.22 million from 5,204 vehicles. However, Mr Tinega defended the county's move explaining that their core mandate is to deliver services to Nairobi residents and not profit-making, besides implementing pledges made by Governor Mike Sonko to the city residents. "Yes, we are losing the money but the core mandate of a county government is deliver service to Nairobi residents but not to make profit. "We are just trying to collect tax to continue delivering the services to the people. This is part of the pledges that Governor Mike Sonko had promised to Nairobi residents," said Mr Tinega. The director said to cut on the losses, the county plans to enforce a number of measures including increasing parking space both on-street and off-street, reduce the number of parking attendants to control collusion between them with motorists and also step up enforcement. He said City Hall is planning to build a multi-storey building parking lots in the city centre to accommodate more vehicles in partnership with interested private firms. He said the sunken parking area located between Aga Khan Walk and Taifa Road, off Harambee Avenue, has been identified for one such building. "The duty of the parking attendants is mainly to assist motorists in making payments by guiding them on how they can do it digitally while the work of enforcement team is to inspect the vehicles and confirm with the parking attendants whether the fee has been paid in order for them to clamp the non-compliant vehicles," he said. On off-street parking, Mr Tinega said the county government plans to increase more spaces in off the Central Business District (CBD) like in places like Westlands, Ngara, Upper Hill and Pangani to ease the pressure on the available spaces. "We are working on about three to four off-street parking areas as we strive to expand parking spaces. We will do an expression of interest and identify the firms that will agree to partner with us," he said.